Thursday, April 18th, 2019 - Categories: Events, Uncategorized. Excellent Parking & Raffle Prizes! It’s simple. 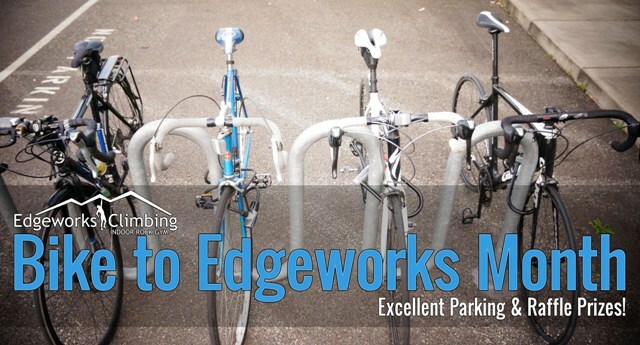 Each time you ride your bike to Edgeworks to climb, take a fitness class, or workout you’ll receive one raffle ticket to be entered in a drawing for prizes including Edgeworks swag, FREE day passes, and more! The more you ride, the more chances you have to WIN! So get on your bike and RIDE. Tickets are limited to 1 per person/day for rides that occur during the month of May 2018 only. Tickets must be collected at the time you and your bike are at Edgeworks; no “oops, I forgots”. Raffle is open to everyone and all ages, including members and non-members. Drawing will take place Monday, June 3, 2019. Ride safe. Ride smart. And always securely lock your bike to one of our racks.